6. Vandy - Bye week - yeah, They're below Ole Miss...Rebs/Dores ATL rematch? 12. Arkansas - Might as well hang em up...The cupboard is bare, right? 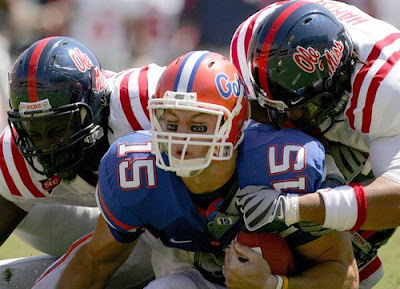 Is Tebow getting the double team? dont we have the AP rankings,this ole miss crap is ridiculous. why isnt vanderbilt and auburn ahead of them. you cant expect people to take your rankings seriously. Bama Fan of the Week: "NoShameJamezzz"